How a 4th Generation Public Sector Balanced Scorecard can help you manage amidst austerity and service delivery pressures. The whole of the UK public sector is having to reduce costs, whilst trying to protect services and capability. Cost reductions range from the Ministry of Justice cutting £1.5bn from a 9.8bn budget, to a city council wanting to cut £150m from their £450m budget. Clearly the solution does not lie in simple efficiency or effectiveness. More radical service delivery, policy and strategy changes are required. Our experience of working with many organisations has led us to a model of the Public Sector Balanced Scorecard and Strategy Map which has been successfully used to capture the both the variety of service delivery models and the differing strategies to deliver change and cost savings. Our clients say it better represents, captures and describes what they actually do, than a standard public sector balanced scorecard. The popular Public Sector Scorecard (PSS) model presupposes strategies such as Operational Excellence. Yet many more alternative strategies are available and indeed are necessary in today’s environment. What about preventative approaches in the NHS and social care sector, or policy changes in the justice and policing sector? These require far more than operational excellence. Most Public sector scorecards fail to model and capture the rich complex communities, environments and partnerships we have in sectors such as Justice, Health and Education. In these situations the community is served by many different bodies (eg GPs, community health services, hospitals). Often the actions of one body has consequential effects on other bodies, for instance changes in preventative care ultimately changes the mix of patients in expensive hospital care. 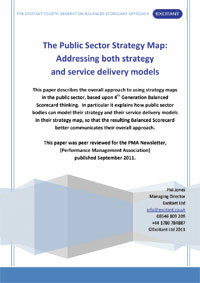 How do you model alternative service delivery approaches? Is there a richer, more flexible and more useful model that can describe today’s public sector challenges and be used to manage the delivery of benefits? The answer is yes. Over the past 10 years we have worked with public sector bodies ranging from the NHS and City Councils to the MOD, and DWP and HMRC. We have also worked with third sector and not for profit organisations as well as providers to the public sector. Our experience of their variety of strategies and service delivery models has led us refining the standard strategy map and balanced scorecard model. A refinement that help such organisations to model both strategy and service delivery, far more effectively. This means as executives and managers you can describe, communicate and track your strategies for change far more effectively. This has led to the development of Excitant’s Fourth Generation Strategy Map and Balanced Scorecard for the public sector. This is an approach that our clients say helps them to model and manage the sort of complex service delivery and cost reduction approaches that we are immersed in today. Our public sector clients say that this approach helps them to capture strategy, complex service delivery models, partnerships more clearly. It helps them to plan, manage and trace their impact and outcomes more effectively. Importantly, it provides a balanced scorecard that supports strategic change. This means that you can plan and assess the impact of changes so that the promised benefits can be reliably tracked and delivered. This paper will undoubtedly help you, but you will appreciate it is short. If you are serious about tackling this challenge, we have client examples that range from NHS Strategic Health Authorities and PCT’s looking across their entire care delivery community, Unitary Authorities creating joined up thinking and working across their entire range of services, to the complex roles of central government departments such as the HMRC, MoJ, and DWP. We also have client case studies for costs reductions and service improvements in services such as IT. We have client examples from front line strategy maps and scorecards such as hospital clinics, care services and environmental planning. We have many that include partnership working. The NHS and a GP Practices balanced scorecard: Oh no it is not! The Balanced Scorecard in the NHS and GP practices: better, but historic. The problem of single point targets: A tragic NHS story.